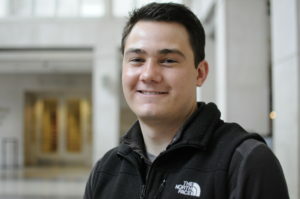 Matthew Genet, a first-year medical student, received a fellowship from the Alpha Omega Alpha medical honor society to support his research studying brain cancer. Matthew Genet, a first-year medical student, received a 2016 Carolyn L. Kuckein Student Research Fellowship, awarded by the Alpha Omega Alpha medical honor society, for his research on the role of the protein IDO1 in human glioblastoma, a type of brain tumor. The award supports Genet’s research project for the summer under the mentorship of Derek Wainwright, PhD, assistant professor of Neurological Surgery and Microbiology-Immunology. Genet started working in Wainwright’s lab earlier this year as part of his Area of Scholarly Concentration research project, a four-year longitudinal project that culminates with a thesis. Genet was also recently selected as a 2016 Research Grant Program recipient by the American Medical Association.